Happy holidays to all our readers! In honor of the season, here are a few seasonal tidbits for your enjoyment. I remember being a kid back in the ’70s, when my favorite thing about the holidays was calling the toll-free number to NORAD as it has tracked Santa and his sleigh across the sky. 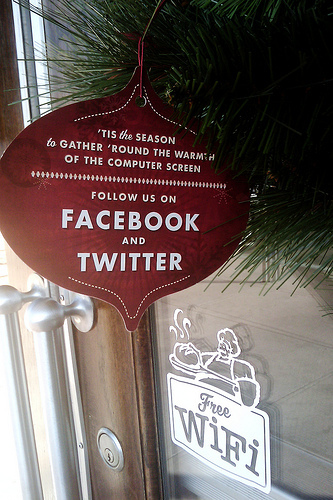 Now, over three decades later, and the jolly fat man has embraced social media in a big way. In addition to tracking Santa on the NORAD, Google Earth is also available to help kids track his flight. Kids can still call NORAD at 1-877-HI-NORAD from 4:30 a.m. on Christmas Eve to 5 a.m. on Christmas Day. Kids can log on to NORAD’s Facebook page, Twitter account, and Picasa photo album. Who knew the big jolly man would be so up-to-date with social media in between all of the gift-giving around the world? Just goes to show, everybody is more connected these days. And the Twitter bird in a pear tree. No matter which mid-winter holiday you celebrate, this is a season of good cheer. The days are getting longer again, and the triple theme of friends, family, and food is common to all. Have a wonderful holiday, and if you feel like giving to those less fortunate than yourself, there is a vast number of ways to do so through Facebook and other social media platforms. Image by billaday, used under its Creative Commons license.